LSP Industries, Rockford, IL, introduces its new MiniCoater lubrication system, complimenting and extending its line of stock lubricating equipment available for the stamping industry. • Controlled lubrication—dispenses only the quantity needed, where it’s needed. • Lubricant dispensed on the exterior of the rolls to prevent clogging. 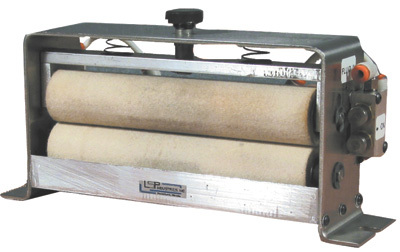 • Fast roller removal and replacement, in less than 2 min. • Four models available for stock from 1⁄8 to 9 in. wide. • Stainless-steel frame designed to ensure years of rugged use.